Very few are able to turn hobby into job And may be the guy is one of them And if not, He is one of the best marketing person. And yes, Kavi thanks for writing such a beautiful description within simple words. Thanks. Keep traveling, Keep writing And sharing always. This was brilliant music of the nostalgic kind. A modern interpretation of what my grandfather (he would have been > 120 years today) use to say : “whatever you do for work, treat it like it’s a puja to God. Enjoy doing it well.” And then he would give us the example of a sweeper, who did absolutely first-class sweeping – you always knew when he had been around ……and he was no less than a big boss somewhere who supposedly “worked”. So many of us, do not even notice this wonderful music of those who enjoy their karma. Kavi,great post..if ‘great’ tells you what I really mean ! wow..such a vivid description..so beautifully written..
the guy must be a genius..the parathas look yummy.. 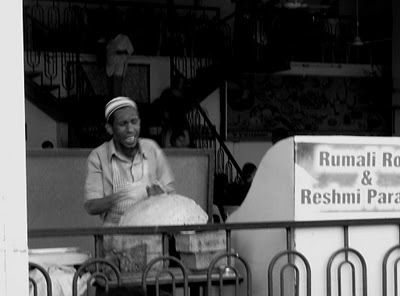 I am hungry and nostalgic at the same time..
You took it further to show how to enjoy, like and live the work you. I know – these guys are no less than the pizza dough makers. 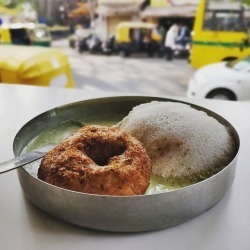 And they do it at roadside stalls amid all the din! And to think he enjoys his work too. Wonderful observation and you have penned it very well. I wish I see these people when I visit. At times I realise that we do not sing nowadays. We could only envy such people. 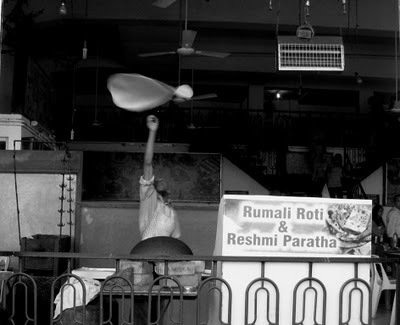 The toss of the rumali roti brought back a lot of memories. 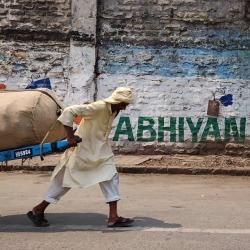 This was a common sight in many areas in Delhi where I grew up. Those were also the days when I sang a lot more, after all the young and the restless are always on a song. Nice post, made me realize I haven’t sung for a while now. So get your earplugs out, Kavi. please start videoblogging.. if your photoblogs are this good, can’t wait to see videos .. where we see the world through your eyes. 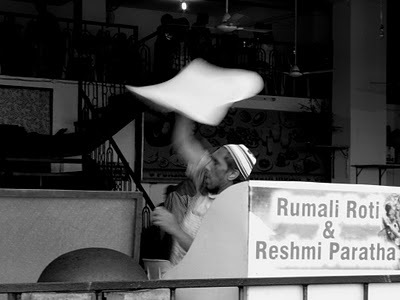 The making of rumaali rotis is indeed an art in itself. 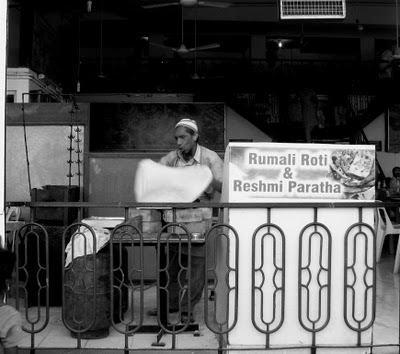 Music will perhaps embellish it, but rumali roti makers are artists even without the harmony! I envy a nation with such culture. The closest we come are the hot dog vendors — and they do not sing! Its an art!! Not all of us could do that without breaking off the dough or missing a step. 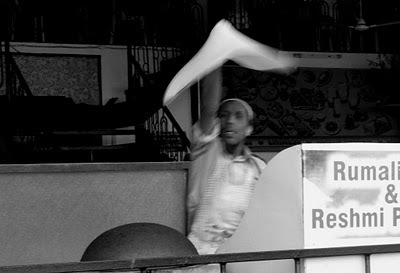 You are from Madurai, so you must be really familiar with making of Koththu paratha. What music!!! accompanied with the aroma… Hmmmmm……….and the tea. The art of cooling tea by whisking it from as far as possible!! Wow!! Hobo : Thank you! I am just a fellow traveller like you. Cant write as frequently as you, but still try to. Thanks for all the nice things that you say ! 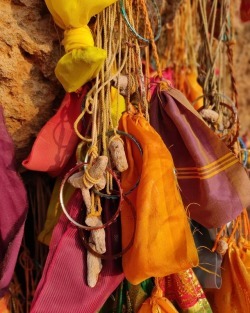 Ugich Konitari : Acharya has a way with things ! And there are Big Bosses who sang while they worked too ! So did mothers, sons, daughters. Drivers and book keepers ! Nu : Thank you ! Its fantastic to hear that you are always on a on song ! That comes, perhaps because you enjoy the things that you do ! Will check out the new blog ! Neha : Thank you ! I am not sure about the genius quotient. But i am reasonably sure of his happiness quotient ! The Holy Lama : Thank you ! Thank you ! Braja : 🙂 Thanks ! Radha : yes. Isnt it awesome. to think he enjoys his work while there are those that crine in airconditioned cubicles. Its not about the enviroment ! Sing ! Lets have some music ! Sucharita : You bet. Thats an art form ! The making of it. The eating of it is a different story ! Aativas : yes. The beginning always leads to the end ! 🙂 Thats all thats there to life and living ! 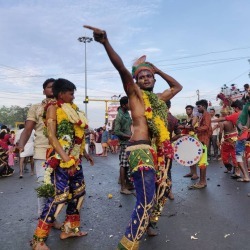 Chandrika : Thank you !